Beyond its role as a harbinger of spring, until recently, rhubarb didn’t excite me very much. I always thought the stalks were lovely, speckled in shades of sorbet-vivid green and fuchsia, but rhubarb’s tart herbaceousness was never my favorite. But then I tried a cocktail, made by a friend who knows her way around cocktails. She also knows how to bring out the best in rhubarb. Her concoction blended rhubarb syrup and bitters with gin, basil, citrus and vinegar. It was delicious–both complex and refreshing. 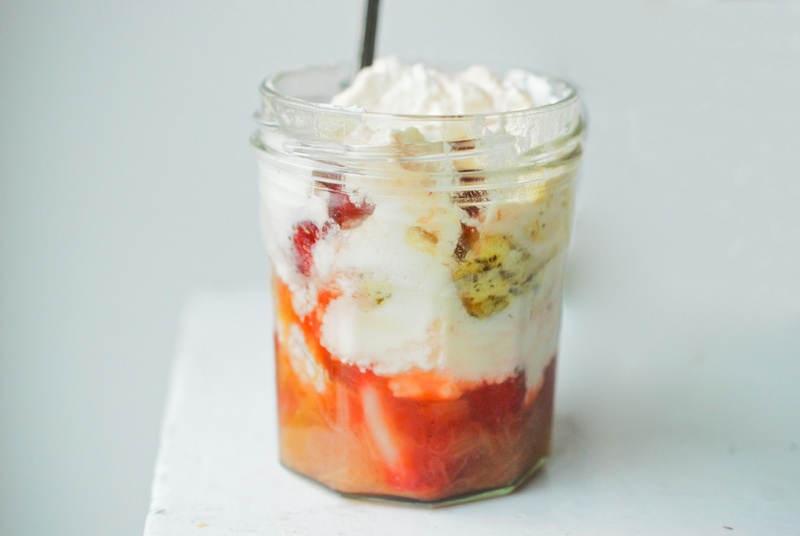 So when the first stalks of rhubarb appeared at the farmers market, I decided to run with her flavor combination, in my take on an Eton Mess. The resulting dessert is a bit on the savory side, thanks to the basil, the rhubarb, and the gin. 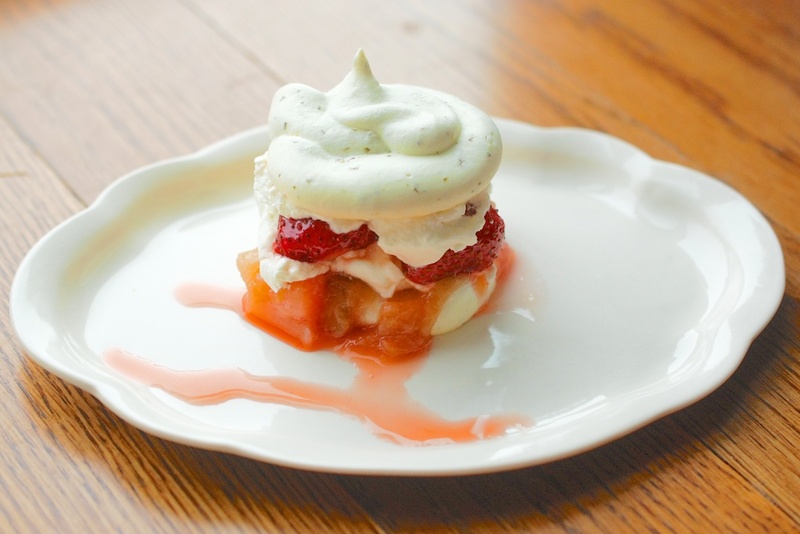 The strawberries and cream add sweetness, and a cool freshness, to the proceedings. I’m tickled by how the meringues turned out: taffy-soft on the inside and crisp on the edges, redolent of basil and lemon in equal measure. 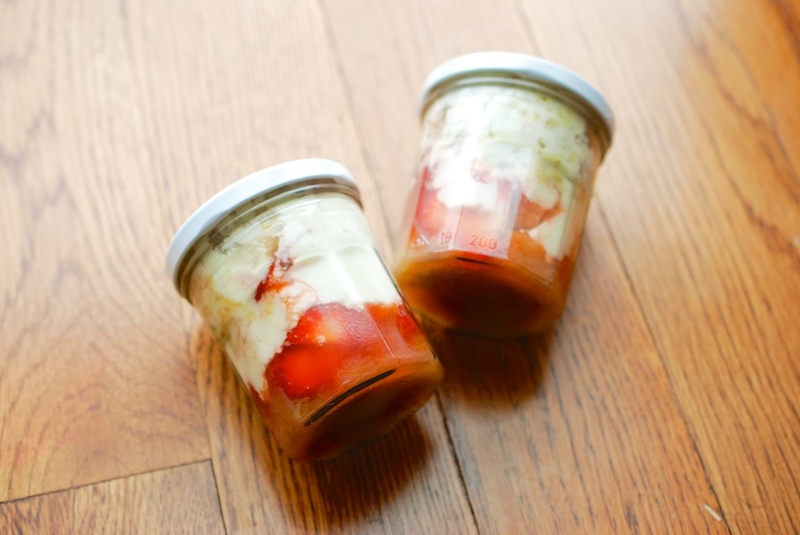 Stack the ingredients in a jelly jar, and bring them along for a picnic. 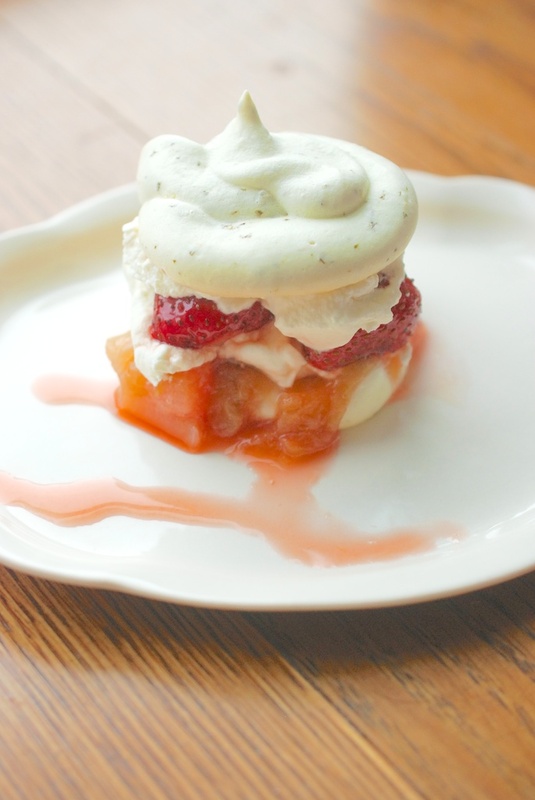 Pretend you are a fancy pâtissier, and make large macaroons–cream, strawberries, and rhubarb jam sandwiched between two meringue coins. Layer the ingredients in a short fat glass, like a trifle. You can prepare these in advance for a dinner party, or allow guests to build-their-own. Double the meringue recipe, and make two cake-sized circles. From there, use the strawberries, the cream, and the jam as you would frosting, for a different take on birthday cake. 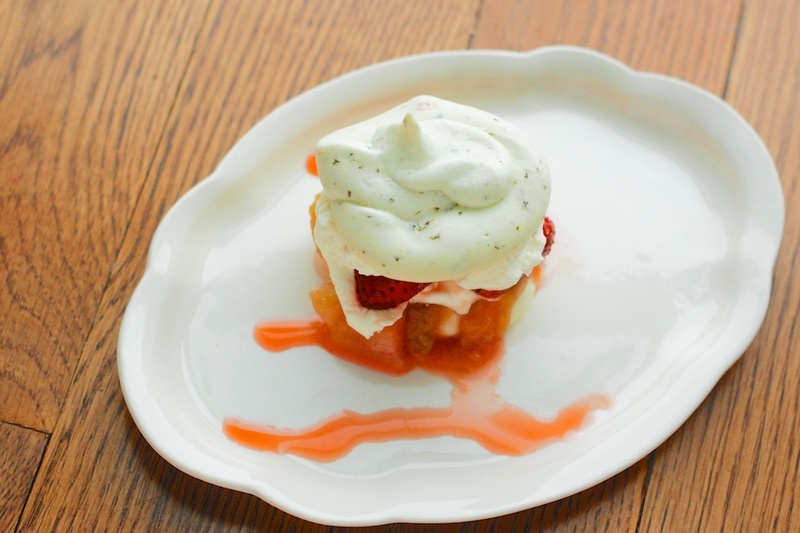 Regardless of how you serve it, this dessert reminds sweetly that it’s spring at last. A note on making ahead: With the exception of the strawberries, which I think become quite sad after sitting around a while, you can make all parts of this dessert 1 day ahead. It’s almost like a magic trick: to start with such a small quantity of egg whites, and watch the volume increase tenfold. I love how these meringues turned out–now that I know how easy they are to make, and how sophisticated they look and taste, I think I’ll be experimenting with many more flavor combinations in the future. For this recipe, I took tips about proportions and temperature from Will Torrent’s book, Pâtisserie at Home, and advice about process from the wonderful home cooks at Food52. 1. Heat the oven to 225F. 2. 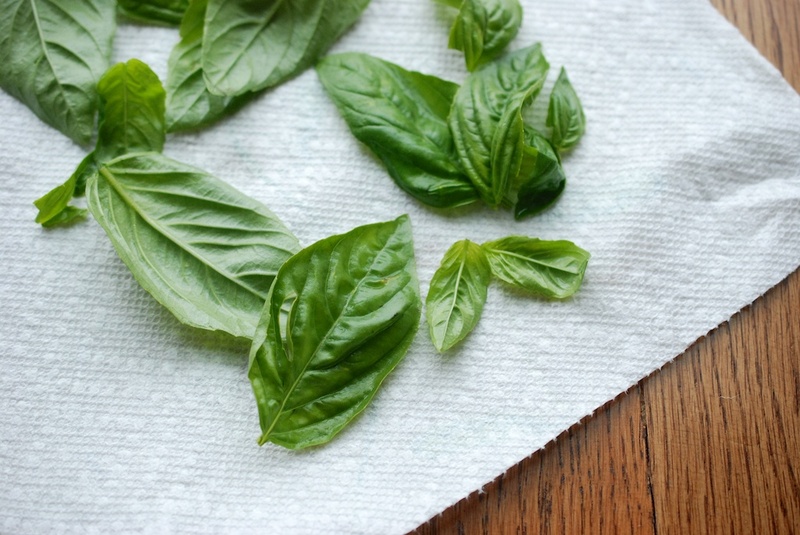 Wash the basil and dry it well, and then move the leaves to the bowl of a food processor. Zest the lemon (directly into the food processor, for ease). Add 2 tablespoons of the sugar. Set the bowl aside. 3. Empty the eggs whites and the lemon juice into a metal mixing bowl. Set the mixing bowl over a simmering pot of water, and beat the whites using an electric mixer on medium-low speed; whisk for about 3 minutes, or until the egg whites begin to froth. Add 3 tablespoons of the sugar, and increase the speed to medium; whisk until the egg whites are a bit stiff, 4-5 minutes. Now add the remaining 3 tablespoons sugar, and whisk again, another 4-5 minutes. Turn off the heat under the water bath, and move the bowl to the countertop. 4. 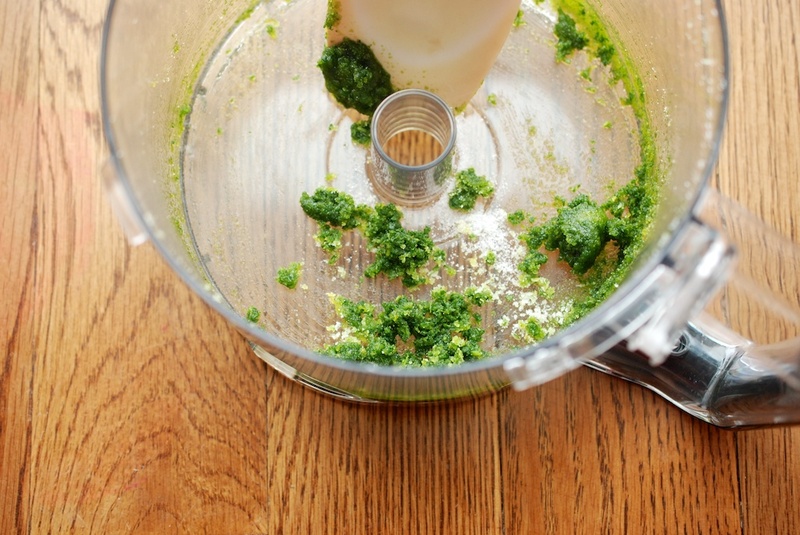 Pulse the food processor for about 20-30 seconds, until the basil and the lemon zest have incorporated into the sugar. (Wait to do this, until just before you add this sugar to the egg whites–you don’t want the basil to brown.) Add the basil-lemon sugar to the egg white bowl, and beat on medium speed, another 2-3 minutes. 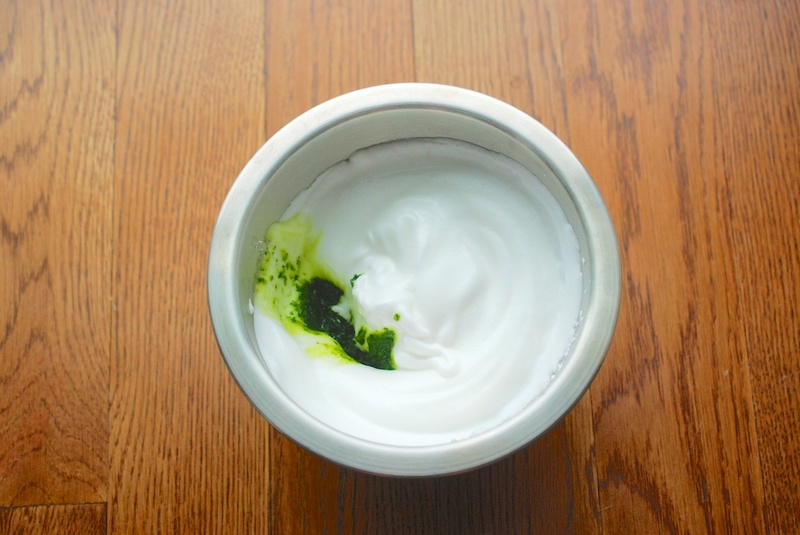 The egg whites should be tinted lightly green, flecked with basil, and stiff enough to form peaks. 5. Move the meringue into a piping bag–I simply used a large, zip lock bag with a hole snipped into one corner. (You could also just use a spoon to scoop little clouds, if you’re going for a more rustic look.) Pipe the meringue onto a parchment paper-lined baking sheet; my batch yielded 16 meringues, but you choose how large or small to make them. 6. Move the baking sheet to the oven for 1 hour, and then turn off the heat. 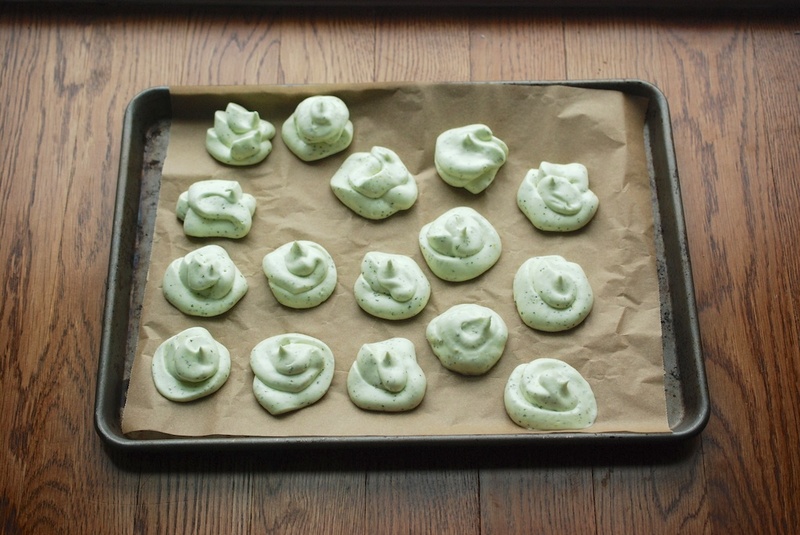 Without opening the oven door, let the meringues rest for at least 1 hour, but up to overnight. If you have extra jam, or if you simply want to make a batch on it’s own, this quick, refrigerator jam is delicious on toast or English muffins at the breakfast table, or stirred into plain yogurt. You can also use it as a filler, along with frosting or cream, on cake. 1. Cut the ends off the rhubarb stalks, and also cut away any bruised bits. 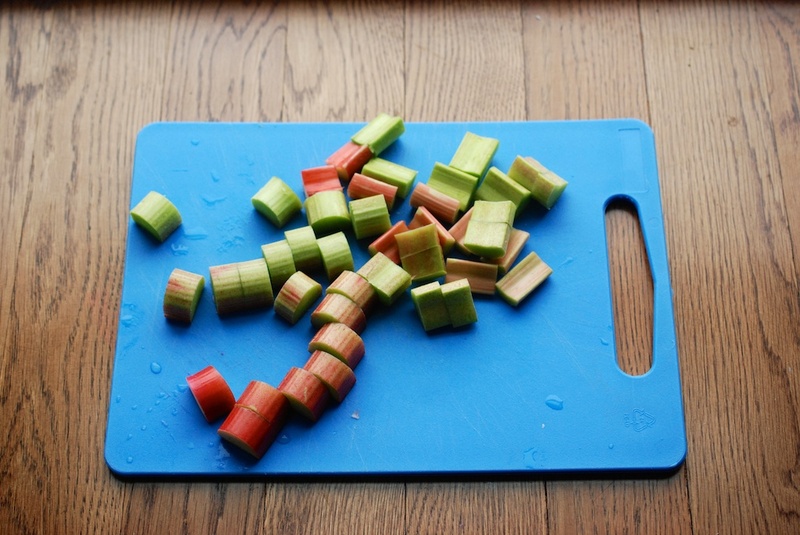 Now slice the rhubarb into pieces, about 1/2-inch long. 2. 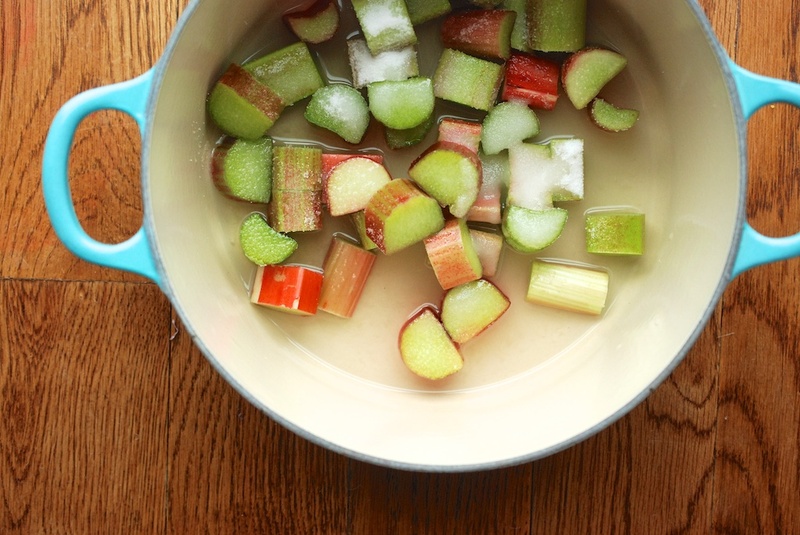 Move the rhubarb to a medium saucepan, along with the lemon juice, the sugar, the gin, the pinch of salt, and 1/4 cup of water. Turn the heat to high, until the liquid starts to bubble, and then lower the heat to medium low. Stir occasionally. Cook the rhubarb for about 20 minutes, or until the rhubarb is jammy, but retains its shape a bit. Let the jam cool; it should fall apart a bit when you stir it. 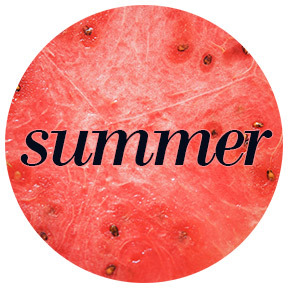 Slice the tops off of 1 punnet full of strawberries (about 2 cups), and then slice the strawberries into halves or quarters, depending on the size of the strawberries, and your personal preference. 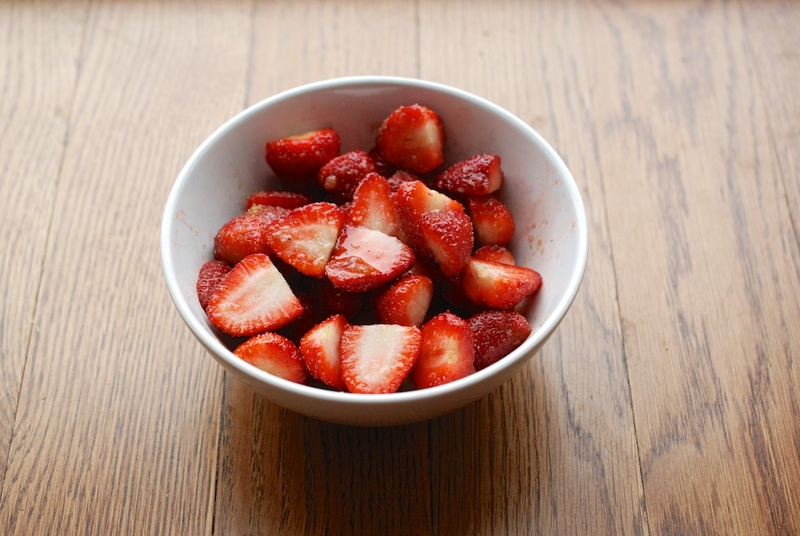 Move the strawberry pieces into a medium bowl, and stir in 2 tablespoons of light brown sugar, until the strawberries are evenly coated. Cover the bowl with plastic wrap, and let it sit for at least 30 minutes, or until strawberry syrup collects at the bottom of the bowl. Whip 1 cup of heavy cream. I like to keep the cream on the runny side, the consistency of stirred yogurt, but it’s up to you. The cream should be cold when you whip it. 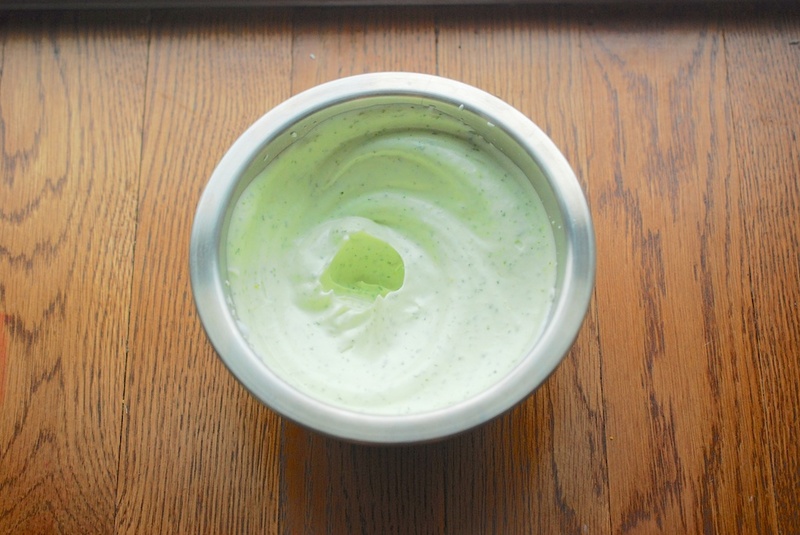 Move it to the fridge for a little while after you whip it, so that it’s also cold when you serve it. 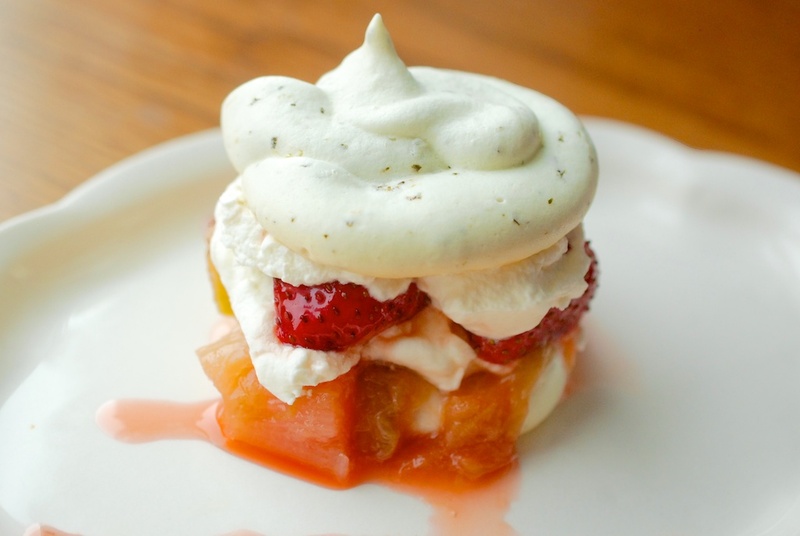 There are really no rules for how, or in what order, you put together the meringue, the jam, the strawberries and the cream. You can crack the top of each meringue (for example, to fit them into a jar), or not. I recommend drizzling some of the strawberry syrup over the top of each, to finish. Cristina those are gorgeous!!! I saw the Eton Mess on pinterest and couldn’t pin it fast enough, I love the basil in the meringue and how you used that instead of a biscuit, so light and it’s just a perfect spring/summer dessert! Extra jam, yes please the gin is a stroke of genius!! This sounds amazing. 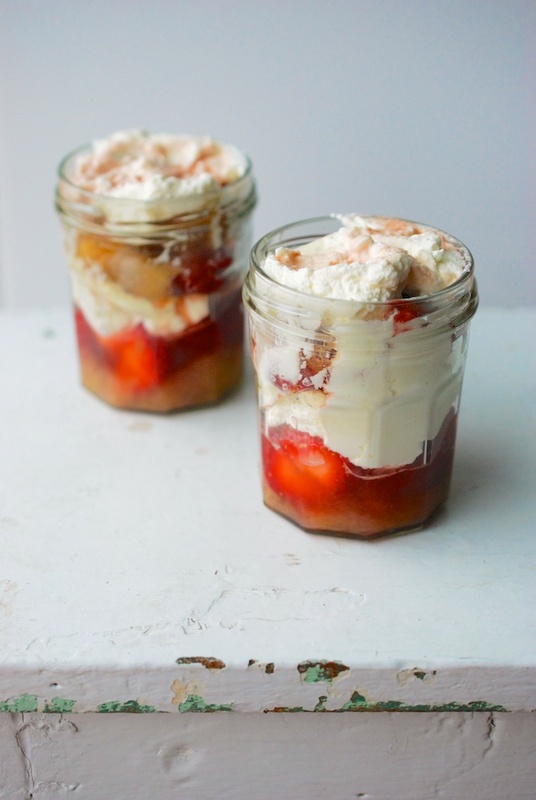 I love Eton Mess and a friend just gave me a lot of rhubarb so I have it in the freezer … I guess this is a delicate taste, you would need to be careful what you served it after …? Agreed. I think this would be perfect for a spring or summer afternoon, preferably outside. I like to bring it along on picnics (in a jar), too! Look really good and photos are great. 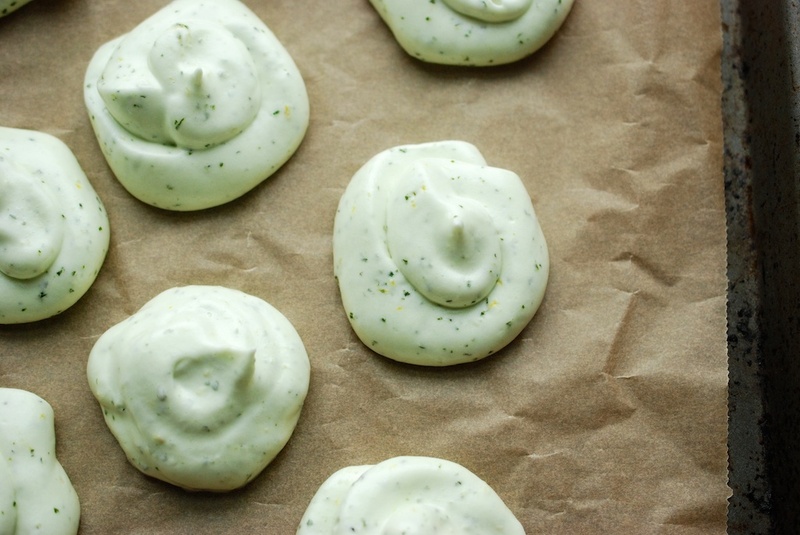 Love the idea of basil meringues and think they would be great in a starter with shellfish!